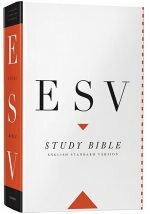 You can now access the ESV translation of the Bible in audio format free at the ESV website. B.C. McWhite explains how he uses this in memorizing the scriptures at his blog. The download are in mp3 format, and you can download any chapter you like. The main proviso is that you cannot download a whole book, and cannot have more than 250 verses, in line with the ESV copyright. Here are the steps required, I’ve checked it out and it is pretty easy to do. Go to the ESV Online site. In the top right corner of this page, click on the “Options” tab. Under “Audio Options,” click in one of the buttons for MP3 (I use David Cochran Heath because he has the most “normal” sounding voice). At the bottom left of the page, click the “Save” button (that should open a page that says, “Your preferences have been saved” at the top). When the box pops up, you will have to add an extension name on the end of the title if it doesn’t have one. So, for example, if the title of your selection is “49004029″ then you need to add .mp3 on the end, so that it reads “49004029.mp3″. Save the file to your Desktop. Find the file on your desktop and open it with iTunes or Windows Media Player, or whatever you use. You can then load it onto your iPod, MP3 player, or burn it onto a CD for your car. The ESV team fully endorse this approach, indeed they even posted on B.C. White’s method in this post. please send me esv audio bible. I want to buy an ESV MP3 whole Bible download for my son-in-law. How can I do this? All I can find is an American one which doesn’t give me the possibility of sending to Uk! Need it for a birthday present in a hurry!!! naturally like your web-site but you need to check the spelling on quite a few of your posts. Several of them are rife with spelling issues and I find it very troublesome to tell the reality then again I’ll surely come back again. Blue letter bible – unleashing the power of the bible online! online eSword review – free bible study at its best! Memorize those bible verses with memverse.com!